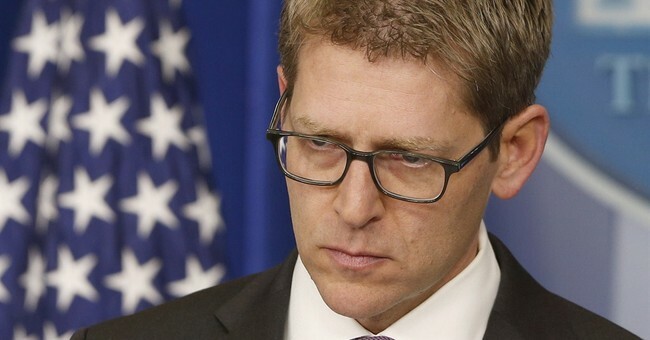 Speaking and answering questions from the White House briefing room Thursday afternoon, Press Secretary Jay Carney tried to spin newly released and damning Benghazi email evidence as Republicans politicizing a tragedy, accusing them of being conspiracy theorists. "What hasn't changed is the effort by Republicans to claim a conspiracy when they haven't been able to find one," Carney said, adding Republicans are, "trying to politicize a tragedy." In case you missed it yesterday, new emails show White House National Security advisor Ben Rhodes deliberately altering talking points to cover-up the terror attack by shifting public focus to a YouTube video. This was the talking point used by former UN Ambassador Susan Rice on five Sunday shows nearly a week after the attack when the White House had known for days the incident was connected to al Qaeda and in fact a terrorist attack, not something prompted by a protest outside the consulate. "This is a conspiracy theory," Carney said. "How much time have we spent focused on talking points?" Carney also promised the administration is dedicated to bringing the Benghazi perpetrators to justice, despite the fact not a single person has been arrested for the 9/11 attack. "There is an active investigation to find the people who are responsible. There is an active investigation into the details," he said.